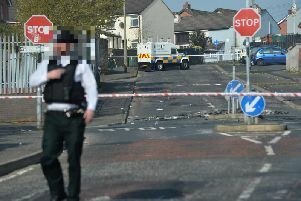 A man is being questioned by police in connection with the security alert which disrupted Remembrance Sunday in Omagh last month. Police arrested the 36-year-old this morning following the search of a house in the Omagh area. DI Trevor Stevenson said he was arrested “on suspicion of being concerned in the commission of a terrorist act and possession of explosives with intent to cause an explosion”.